Florida is home to many world class coastal resorts and beach destinations, with Panama City Beach standing out as one of the very best. Situated in Bay County in the Florida Panhandle area, Panama City Beach is home to just 12,000 people but attracts many more each and every year due to its prime location, soft sandy beaches, and upscale resorts. Many people travel here from the Southern United States in particular, especially around the times of spring break and summer months, and the city, which has the slogan 'The World's Most Beautiful Beaches' is simply idyllic as a place to rest, relax, and soak up the sun. It's home to some great, family-friendly attractions too like the Shipwreck Island Waterpark, Gulf World aquarium, Wonderworks, ZooWorld, Coconut Creek Family Fun Park, and Ripley's Believe or Not museum. These attractions, combined with the white sands and near-constant sunshine the area is known for, have helped to make Panama City Beach a prime destination for all kinds of vacation. So no matter whether you’re traveling with young children in search of some family fun or heading down to the coast with your buddies for beach BBQs and water sports, Panama City Beach can bring your dreams to life. 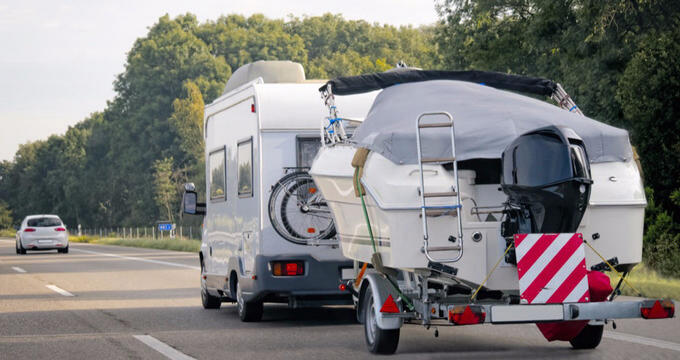 Lots of great RV parks and campgrounds can be found in the local area, with some being situated mere minutes from the sugary sands and warm waters of the Gulf of Mexico. Read on to learn all about the best RV parks in Panama City Beach to make your next trip to this Florida city as memorable and magical as possible. Situated in a prime spot in the center of the city, not far from the Gulf World aquarium and the Shipwreck Island Waterpark, Pineglen Motorcoach & RV Park is one of the top rated RV parks in all of Panama City Beach, FL. Having received a lot of 5-star reviews from past guests for its beautiful setting, excellent amenities, and super levels of service, this RV park is a great option to choose if you're looking for quality, reliability, and affordability. Surrounded by fishing ponds and pine trees, you'll feel a million miles away from noisy cities at this amazing RV park, free to enjoy every second of your stay. Pineglen Motorcoach & RV Park features a lot of great amenities include speedy internet access, spotless restrooms, clean showers, a great laundry area with washers and dryers, a covered pool, big rig friendly sites, a dog area and wash station so your furry friends can join in on the fun, lots of good bass fishing spots, game courts and ping pong tables, fire rings, and scenic walking trails. This is a fully family friendly and pet friendly RV park, so if you’re traveling with kids or canine companions, you’ll be warmly welcomed here. Combining all the fun and functionality of a classic RV park with the luxury amenities and services of a classy resort, the Emerald Coast RV Beach Resort offers an amazing place to spend a few days or weeks on this beautiful part of the Sunshine State coastline. With amazing ratings from past guests, this RV park has proven itself to be one of the best in the area and is part of the popular and reliable Sun RV Resorts chain. If you’ve stayed at a Sun Resorts RV park before, you’ll know exactly what to expect here. Open all year long for your convenience, the Emerald Coast RV Beach Resort is only minutes away from the warm waters of the Gulf of Mexico and offers all the facilities you need to have an amazing stay. On-site amenities at this family friendly RV park include a hot tub, two heated pools, a fully featured fitness center, multiple sports courts, 30/50/100 amp power, paved sites, pull-thrus and back-ins, private picnic tables, premium sites with patio furniture and grills, ice machines, bike rentals, a library, fishing ponds, basketball courts, a picnic pavilion, pet friendly facilities, restrooms, showers, Wi-Fi, cable TV, and more. Another excellent place to stay in the Panama City Beach area, the Panama City Beach RV Resort is situated towards the southern side of the city near Saint Andrew Bay. It's only a short walk away from some of the softest sands and warmest waters Panama City Beach has to offer, while also being conveniently located in close proximity to several great stores and restaurants too. In short, no matter what you need or want to do during your stay, you'll find it very close by this amazing RV park. Offering 69 luxury full hook-up RV spaces, Panama City Beach RV Resort provides high speed internet, pet friendly facilities, a large dog park for your dogs to run around, a huge fitness center with lots of machines and equipment to help everyone stay in shape, a heated swimming pool, free breakfast every Saturday morning, a large laundry area with plenty of washers and dryers, a bar and grill just down the road, a dump station, restrooms, showers, and more.